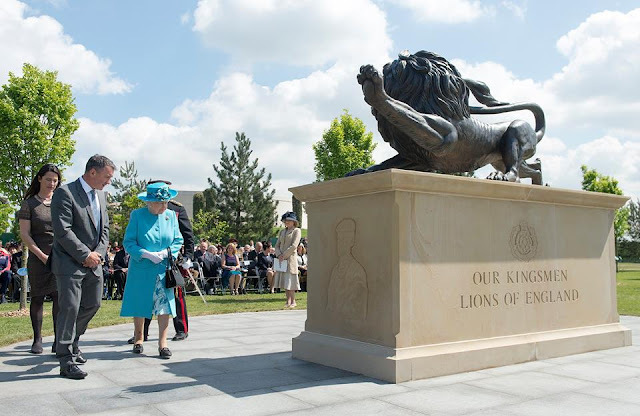 The Queen, Colonel-in-Chief, attended the dedication of The Duke of Lancaster's Regimental Memorial at the National Memorial Arboretum, Staffordshire. The story many articles are picking up here is that The Queen wiped a tear from her eye during this ceremony. While I think headlines are often a little too overenthusiastic in picking up on any such gesture, it would be totally understandable if emotion did get the best of her today. Anyway, with regards to what we do here, of course this occasion called for the appropriate regimental brooch. Not only is The Queen Colonel-in-Chief of the Duke of Lancaster's Regiment, she holds the actual title of The Duke of Lancaster, so of course she had just the right badge on hand. Details in the brooch post linked below.